Corporate entities who purchase shares pursuant to a private placement in B.C. 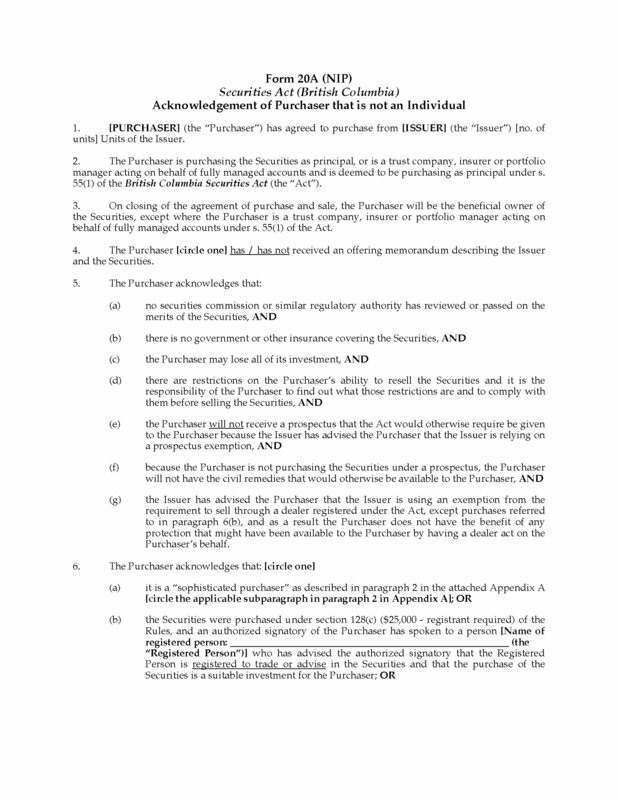 must complete the Form 20A (NIP) Acknowledgement of Purchaser That is Not an Individual. This Acknowledgement must be completed by any purchaser that is a corporation or other non-individual. The purchaser acknowledges in writing all of the various risks associated with the investment, including the risk that all of its investment funds may be lost. The issuer is relying on a prospectus exemption so the purchaser confirms that it will not receive a prospectus. The purchaser must also acknowledge that it is able to assess the merits and risks of the investment because of experience or advice received. Any issuer offering shares to investors in British Columbia will need to obtain a copy of Form 20A(NIP), Acknowledgement of Purchaser That is Not an Individual. Download immediately after purchase.